Our FAQ (Frequently Asked Questions) section is the best place to look for answers to any question you may have about the lawinfochina.com. 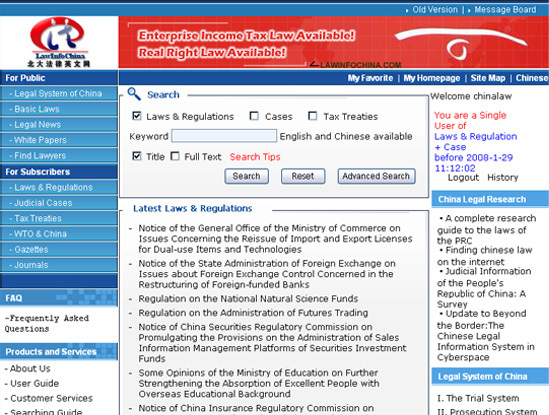 1. what is the relationship between www.lawinfochina.com and chinalawinfo Co.,Ltd. 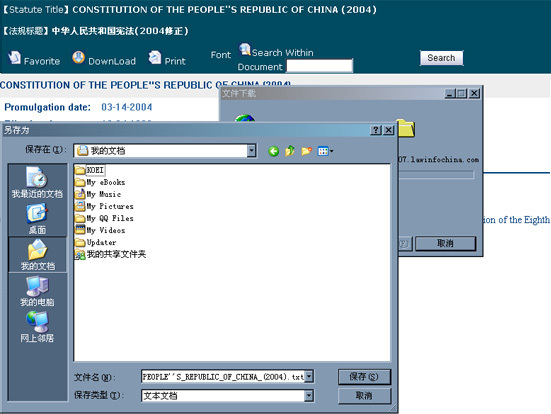 www.lawinfochina.com is the site for English-language resources on Chinese law created and maintained by Chinalawinfo Co., Ltd., and the Legal Information Center of Peking University. Chinalawinfo Co., Ltd., is a legal information and education company, established by Peking University through its Legal Information Center. 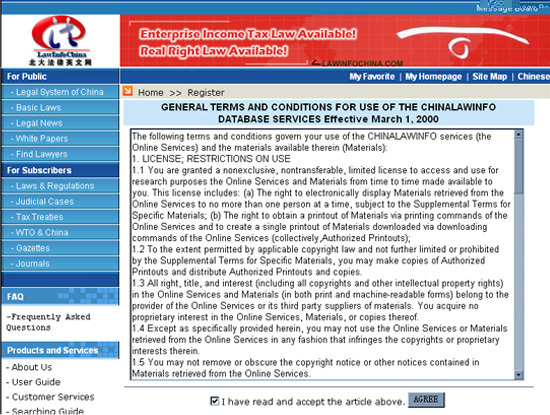 Chinalawinfo maintains lawinfochina.com and it's Chinese sister site Chinalawinfo.com, as well as offering a wide variety of electronic means to access legal information and distance legal education in Chinese. 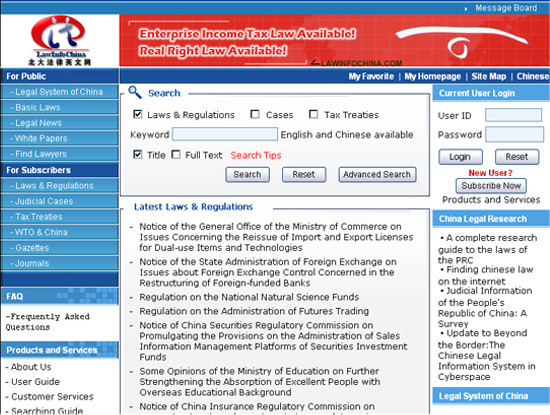 Chinalawinfo's mission is to serve each and every user with high-quality, low-cost and user-friendly products that contain the most complete, accurate, and up-to-date legal information. To enjoy the lawinfochina service, the most comprehensive and authoritative source of reference on China's legal system, you can subscribe to our service by filling out a registration form.Click on the Subscribe link and follow the directions. Once you have completed the subscription request, submit your payment through your preferred payment method. Your account will be activated within one working day of receiving your payment. 4.I have forgotten my Password, what should I do? To retrieve your password, please contact us. 5.How can I change my account information? After you have logged in, please click on "Account" in the left column. After making your desired changes, simply click "Submit" and all is done. This page will not allow you to change your user name. If you wish to do so, please contact us.. You will be required to give your current user name, password, security question and security answer before you can change your user name. 6.How much does it cost? We offer the most affordable and newest pricing plans on the market. Please click here for detailed pricing information. 7.How many kinds of subscription does lawinfochina offer? Normally we offer one subscription, but if you have any other request, please feel free to contact us. We offer a variety of payment methods. Please click here for more information. 9.How can I quickly find the things I want? To search in a given database, click on the name of that database in the blue menu bar at the top of the screen. This will bring you to the main page of that database and there will be a search area immediately below the blue menu bar. Input the keyword you wish to use, check any boxes to limit your search (if available), and click "Search." Click on "Advanced Search" for additional options. Alternatively, you may browse through the directory page. Laws & Regulations is divided into 63 legal topics, Cases into 6 legal topics, and Gazettes and Law Journals by publication. The databases may also be browsed page by page by using the numbered page browser at the bottom of the main page of each database. 10.I can't find the materials I want on a certain subject, what should I do? The 'Search' function is located on the left-hand side of every page of our website. Simply enter a keyword or phrase and click the 'Go' button, and you can expect to get your desired results. You can also limit your search to a particular type of information for a more focused search. Also you can contact us. we will do our best to help you. 11.Who has translated the documents? Our translated documents come from two possible sources. First, the Institute of Legal Translation Studies (ILTS) of Peking University, a publicly recognized institute in the legal translation field, translates the vast majority of documents in our databases. ILTS is a group of talented legal translators well versed in both Chinese law and English legal language. Its goal is to promote Chinese legal translation in both practice and theoretical research. Their translations are accurate, fluent, and timely. Second, for the occasional official English-language version, we provide that version as issued by the promulgator. 12.How can I download a document? To download a document, go to your browser's “File” menu and choose "Save As" or "Save as File." Your browser will give you a number of options such as HTML or text. Results will vary with various formats and word processors. Please use the format that produces the best results for you. 13.How do I print a document? Simply select Print from the “File” menu of your browser.